I just finished a facebook LIVE video, visit my facebook page and scroll down to see it. Hey sunshine people! That’s what I think about whenever I ruminate on orange flavored anything. Oranges = sunshine to me. Only it’s sunshine that you can eat and that’s almost as good as a beautiful sunny day. For most of the people I know who grew up when I did, Creamsicle is a favorite flavor because it makes us think of those beloved popsicles, frozen creamy goodness on the inside and icy orange juicy coating on the outside. This dessert combines those flavors in a convenient little jar, perfect for rationing out to your kids and their friends through the week or for tossing in the cooler and transporting to a family reunion or barbecue on the weekend. 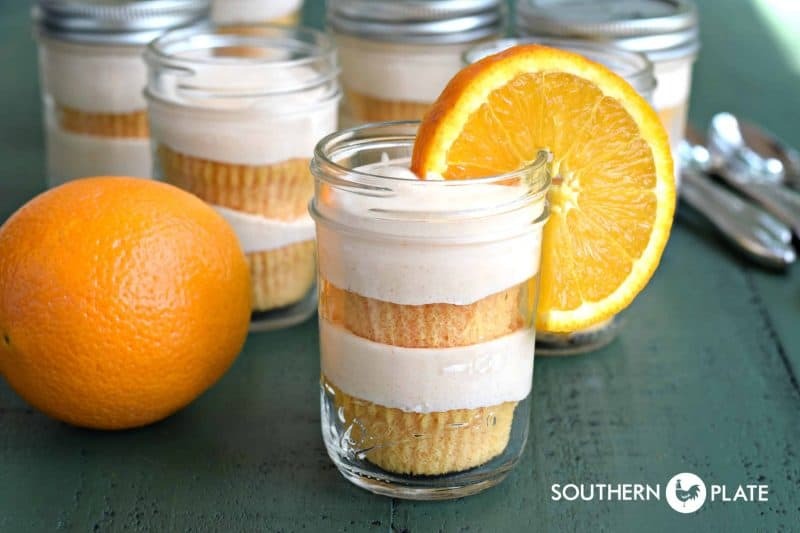 To make these, you’ll need: Orange Supreme Cake Mix* Large container of whipped topping**, Orange Gelatin, Instant Vanilla Pudding Mix, and about 15 – 8 oz jars. 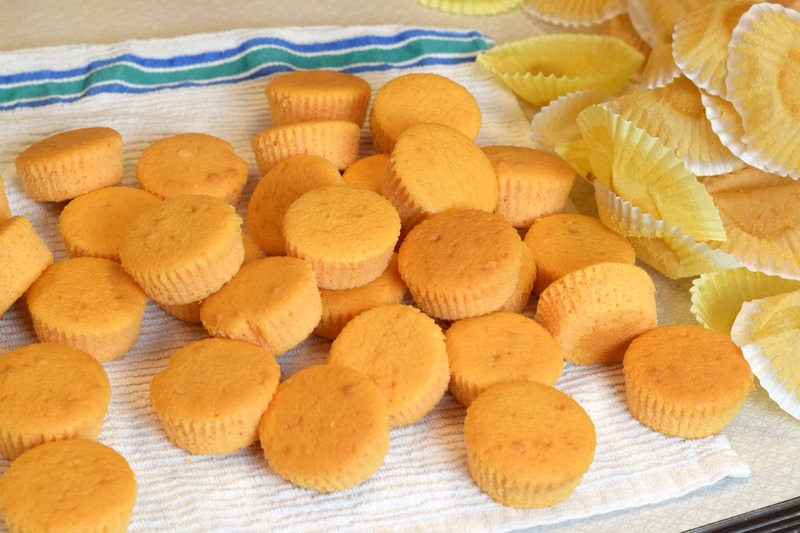 *If you want to use regular cake mix or a homemade cake recipe, make the cupcakes and then brush the tops with thawed orange juice concentrate. **Yes, we know this has hydrogenated oils and a plethora of other ingredients. We all have the internet, too. 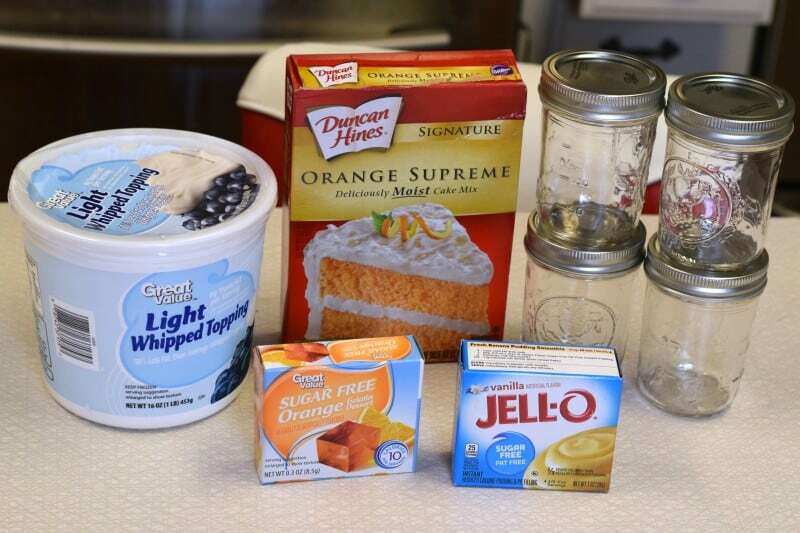 Mix up your cupcakes according to package ingredients. 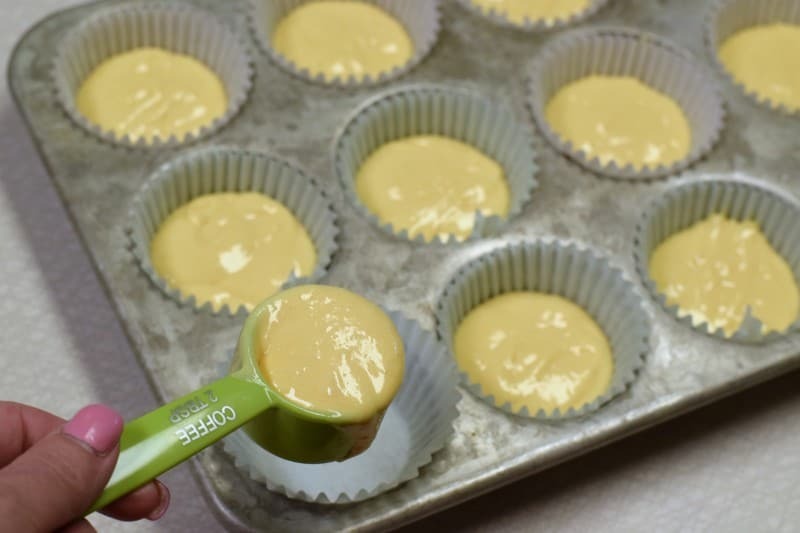 Line a muffin pan with papers and divide batter evenly among 24-30 cupcake papers. Note: I am using a coffee scoop to put exactly 2 tablespoons of batter in each one so I ended up with 30 – and my cupcakes are a nice, even, uniform size. Bake them according to package (or recipe) directions and then allow to cool completely before removing cupcake papers. 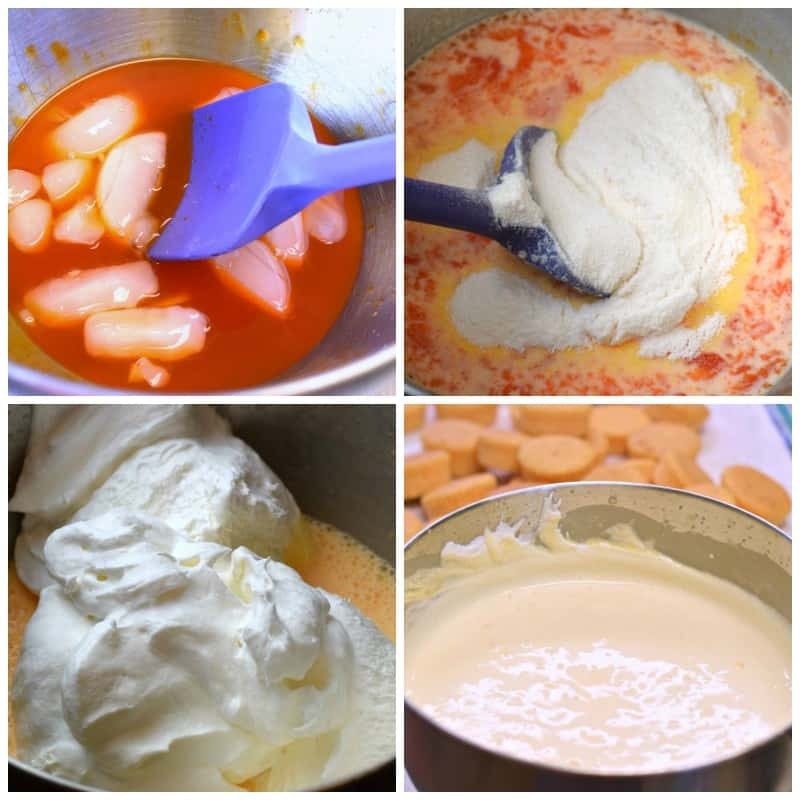 In large mixing bowl, place 1/2 cup boiling water and gelatin powder. Stir until gelatin is dissolved, then add 1 cup ice and stir until that is melted. Add in 2 cups milk and pudding mix. Beat the mess out of this with an electric mixer – unless you are having a particularly frustrating day, in that case, just use your arm power and work some of that irritation out. Dump in all of the whipped topping. Beat until fully incorporated and it looks like pudding. Place half of your cupcakes in the bottom of your jars. Now add a layer of the whipped icing. I put all of mine in a zipper seal bag and cut the tip off because I find that squeezing it in there is quicker, easier, and less messy. However you choose to do it, just put about an inch thick or so layer in each one on top of that first cupcake. Add one more cupcake on top of that. Notice that the cupcake is easier to get in the jar if you pinch it a little bit as you put it in, then it springs right back into shape. Top with another layer of whipped icing and you’re done! 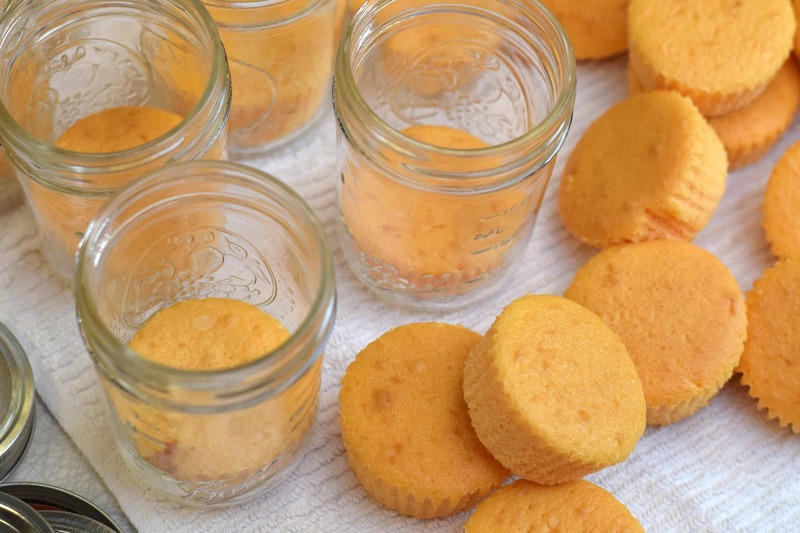 Put the lids on all of these jars and place in the refrigerator for at least an hour for best results. Prepare cake mix according to package directions. Line cupcake tins with papers and divide batter evenly among them. Note: I used a coffee scoop to put exactly two tablespoons of batter in each cupcake paper and ended up with 30 cupcakes. Bake cupcakes according to pkg directions. Once done, allow to cool and remove cupcake papers. In large mixing bowl, place 1/2 cup boiling water and gelatin mix. Stir with a spoon until gelatin is dissolved. Add 1 cup ice cubes and stir until ice is dissolved. Immediately add 2 cups milk and pudding mix. Beat this all with an electric mixer until fully blended. Add whipped topping and beat until fully incorporated. 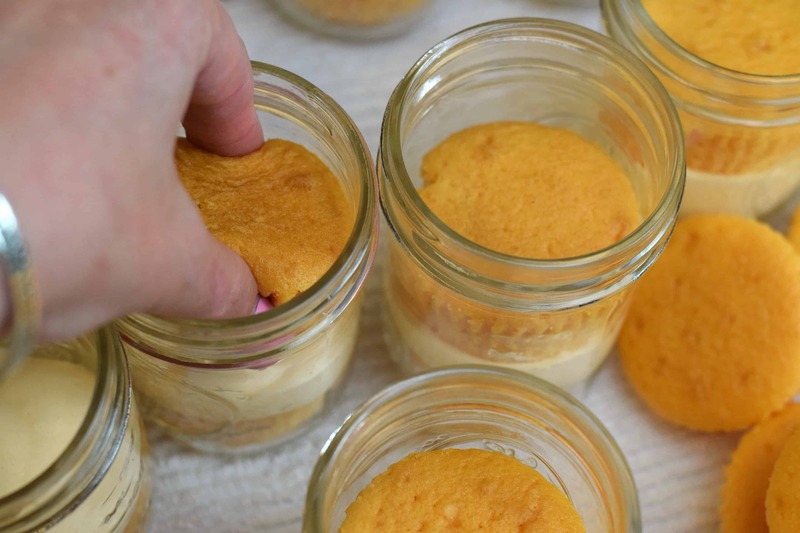 Assemble jar cakes by placing one cupcake in the bottom of each jar and topping with 3/4-1 inch of topping, then repeating one more time. Place lids on jars and store in the refrigerator. 🙂 I agree, we do need different colored hearts for different occasions!! There are several on Southern Plate. Which one in particular are you looking for? So cute! My kiddo would really go for some of those. 😀 But, oh man, that pudding looks so good. I could just sit and eat it up with a spoon. Or, better yet, pour it into a graham cracker crust and let it chill for a few hours. And, how simple to change the flavor just by changing the gelatin, too. It would be easy to change it up Sandy!! I think this would be a great idea for a shower or party! Oh my goodness, it would!! Great thinking Donna!! “When we bend our knees to pray, God bends his ear to listen ” don’t you love this ? Sorry about this….should have had my glasses on….should have said God bends his ear to listen…..so sorry…..Christy can you correct this for me in my above comment…. Wish we had an edit button on here…..seems I always read what I write after I send it and then I see my mistakes…..so so sorry…. I do love it!! And praise God for it daily. I hope you enjoy the Creamsicle Cakes! Recipe looks yummy. I will have to try it soon as I know my grandsons will love it. I can’t wait to hear what they think Janice! What a great idea! We are big fans of creamsicle things, so these are sure to be a hit! I hope you get the chance to try them soon Carlee!! Hi Dawn, you can e-mail me at cj @ southernplate . com. Just remove the spaces 🙂 . I try to get to e-mails in a timely fashion but depending on the volume it can take me awhile. We have a family reunion next weekend and it’s a potluck meal. I think I’ll make this but put it in a trifle bowl. Should I double the amount of cake and icing? The trifle bowl holds 15 cups. I think this is a perfect dessert for summer! I made this and it was wonderful! I did do it in a trifle bowl and it looked beautiful. Thanks again for the recipe! I am so glad you liked it Ellen!!! Do you think it would freeze? I try to half or quarter most recipes. You always have the best recipies, I have tried so many, Thanks so much for all of your efforts to get them to us. Thank you so much Irene!! 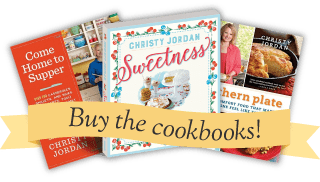 I am so glad you are enjoying the recipes!! Great idea Pat, I can’t wait to hear how they turn out!! NO you didn’t,, well I’m glad you did Another one I have got to try! so many yummies so many decisions what’s a girl to do? 🙂 I did!! I hope you get to try them soon! !